If you're an avid Etsy lover like me, you've probably seen Emily's shop, Which Goose! Emily makes the most gorgeous hair accessories that include natural vine crowns, combs, clips, tiaras, etc. I include her items in almost every treasury I create on Etsy! Emily is a 27-year-old designer who works nights at a newspaper. She spends her days (and any other free waking hour) dreaming, drawing and making whimsical hair accessories. It's become a bit of an obsession of her's! She says "I love that I can create something that will make the wearer feel transformed." Other than Etsy and work, she's a simple kind of gal. She enjoys staying in and watching old movies in her jammies, as well as coffee, antiques, her pet bird Caesar and her sweet boyfriend, Rich. Emily is generously offering her "cocoon butterfly hair comb" which happens to be her very best seller! For a chance to win, please visit Which Goose and leave a comment here about your favorite pieces. Also, if you post this giveaway on Twitter, Facebook or Myspace you can have extra entries for each post. Just leave a link of proof in the comments here. A winner will be chosen at random on Monday, November 30. * Congratulations to our winner, Kate! Wow! 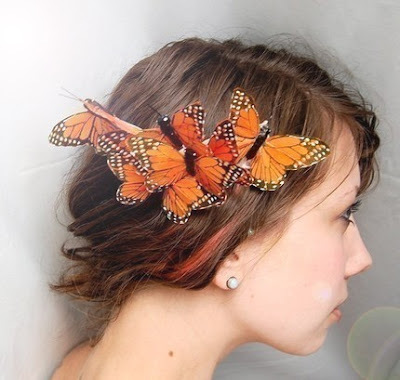 Those butterfly hair clips are beautiful! Just visited her store ... clever girl!! These are beautiful! I would love to win a hair clip! Her shop is so beautiful! ;) Besides the butterfly hair clips, I just adore the bleu whimsical peacock comb! Oh, this shop has already been a favorite of mine!!!! 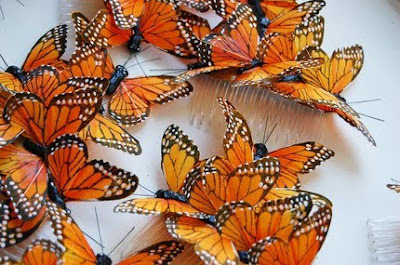 I DO adore the cocoon hair clip...I LOVE monarchs. I also sent a tweet (actually TWO because Facebook automatically sends posts for me)! RT @hautewhimsy Which Goose giveaway http://bit.ly/7fBWZC LOVELY!!! I'm a big fan of Which Goose - I got a lot of inspiration for my own shop from hers. I love her photography, designs and this is hands down my favorite item in her shop! Oh my gosh...I just stumbled on your blog! I love butterflies, and checked out her shop- the butterfly giveaway item is definitely my favorite! :) Thanks for the chance to win! I really like her stuff! Especially all the delicate handbands. First, I must say her pieces are gorgeous. She has no shame in incorporating nature with her pieces to the fullest. My favorite piece is wonderland - natural vine crown. It's extremely unique and bold. Which Goose is one of my favorite shops to browse (haven't yet bought) and I have featured her items in a few of my treasury-like blog posts at http://eyesonetsy.wordpress.com. I find Emily's items to be so beautiful and fanciful, and would just love to call one of them my own. For favorite item, it's a three-way tie between All is Well (whimsical bridal comb), Apple Orchard (floral hair comb), and Wonderland (natural vine crown). Thanks for hosting the giveaway! Very cool. P.S. I twittered about it too! I have always loved this shop! Emily has the most unique ideas and transforms them into such beautiful hairpieces! Love the new holiday combs! Wow, such a beautiful shop - I love the dance - butterfly comb. Wow this is so stunning! its rich but subtle at the same time. it mixes the soft vintage colors and textures to perfection. the whimsical twigs give it an edge, and the whole combination makes it very wearable. My second favorite is just breathe - whimsical flower comb. it looks so soft and romantic and invites you to smell it. it would make every woman look beautiful and feminine. White Goose has so many beautiful accessories, a feast for the eyes. The Sweet Pea Flower ring is just too goregous. The Cocoon Hair Comb is so realistic! I love the green holiday hat. super cute. They are absolutely gorgeous, look so real! Follow me on my new blog ... had issues with the old one. love the plain jane vine. I love the merry and bright holiday hair comb.